Paper Pearl: A Royal Letter...to my mom! 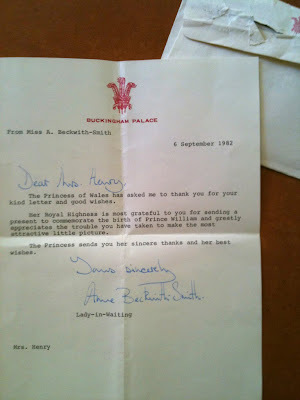 I hadn't planned on another Royal Wedding blog post but my mother just now decided to inform me that she has thank-you letter from Princess Diana's Lady-in-waiting. To which I was shocked and wondered why I have never seen this letter or knew about it! I love the simple Buckingham Palace stationary, such a lovely design of a letterhead! My mother made a cross-stitch for Prince William when he was born with his name, date of birth and a pale blue border that she designed complete with a crown on top. It was matted and framed and sent on to Princess Di. I wish she had taken a photo! The Princess of Wales has asked me to thank you for your kind letter and good wishes. Her Royal Highness is most grateful to you for sending a present to commemorate the birth of Prince William and greatly appreciates the trouble you have taken to make the most attractive little picture. The Princess sends you her sincere thanks and her best wishes.